Be sure to install the front brake disc with the arrow mark "a" on the disc facing out. Front brake disc Refer to "CHECKING THE FRONT BRAKE DISC" on page 4-21. 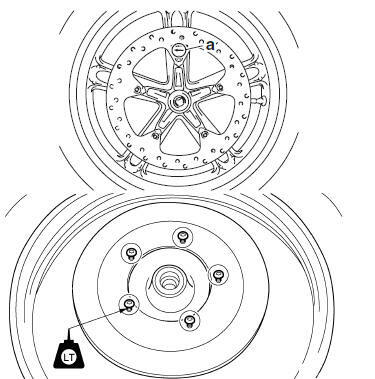 Make sure the speed sensor and the wheel hub are installed with the two projections meshed into the two slots respectively. Make sure the stopper "a" in the speed sensor fits over the slot "b" on the outer tube. Make sure the brake hose is routed properly. Before tightening the wheel axle, push down hard on the handlebar(s) several times and check if the front fork rebounds smoothly. a. Insert the front wheel axle from the right side and tighten it from the left side to 59 Nm (5.9 m.kg, 43 ft.lb) without performing temporary tightening. b. Tighten the front wheel axle pinch bolt to 14 Nm (1.4 m.kg, 10 ft.lb) without performing temporary tightening. c. Check that the right end of the front wheel axle is flush with the front fork. If necessary, manually push the front wheel axle or lightly tap it with a soft hammer until its end is flush with the front fork. However, if the surface of the front wheel axle end is not parallel to the surface of the front fork, align a point on the outer edge of the axle with the fork, making sure that the axle does not protrude past the fork.